Battle Creek Log Homes was originally established in the early 1970s in Alabama, and our company has since moved to our current location in South Pittsburg, Tennessee. 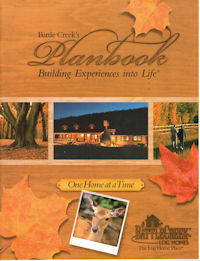 Click below to learn more about everything that sets Battle Creek Log Homes apart from the rest. As a family-owned and operated business, we are pleased to offer the highest quality Eastern White Pine log homes which combine old-world craftsmanship with modern building techniques. We provide a range of services designed to help our customers create unique custom-designed log homes, secure financing, and receive technical and maintenance support. Discover what our many happy customer are saying about our unmatched commitment to delivering quality log homes and cabins along with superior customer service. At Battle Creek Log Homes, we proudly deliver an industry-leading limited lifetime warranty to all of our customers, so click below to learn more about our warranty. As a provider of Eastern White Pine materials and an authorized distributor for Perma-Chink Systems, we offer builder-direct pricing on a wide range of logs, materials, rail systems, corner systems, and other products. Our beautiful model home, the “Battle Creek,” is built in the Appalachian square-log style and is located between Atlanta GA, and Nashville, TN on I-24 west of Chattanooga.